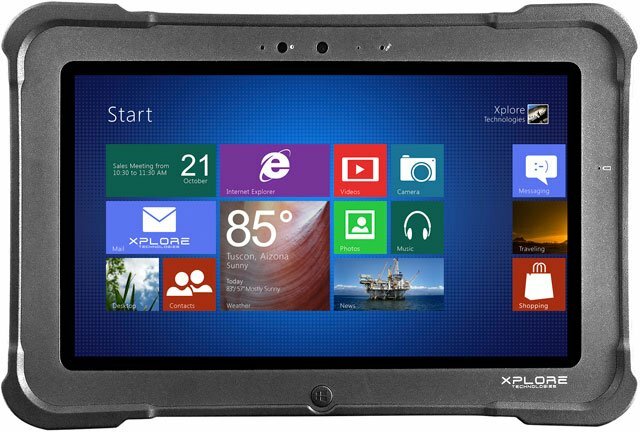 Xplore has announced the release of the Bobcat—a fully-rugged Windows tablet boasting the most comprehensive standardized interfaces available, an extensive array of options through its proprietary Xpansion Port and a sleek lightweight design. The Bobcat operates Windows 8.1 or Windows 7 Pro operating systems and continues to build upon Xplore’s reputation for fully-rugged durability with a MIL-STD 810G certification and IP65 rating. The Windows tablet is an ideal choice for a variety of industries including manufacturing, warehousing and distribution, and utilities. The Bobcat offers a robust suite of standard inputs and outputs that make the transition across different business applications as frictionless as possible. The tablet comes standard with two full-sized USB 3.0s, Micro SDXC, Micro SIM, Micro HDMI-Out, RJ-45 Ethernet, GPS engine and a true serial port connection. The Bobcat is the only fully-rugged tablet on the market to offer GPS, RJ-45 Ethernet and a true serial port connection in one device. With this comprehensive selection of ports, businesses are not forced to making compromises on port selections upon purchase. Xplore has developed a suite of optional features designed to optimize Bobcat for specific industries. Xplore’s proprietary Xpansion Port includes integration options such as a 1D/2D barcode scanner, common access card (CAC) reader and near-field communications (NFC) reader. Warehousing and distribution businesses can consolidate operations and reduce equipment costs with the device’s barcode scanner or NFC reader capabilities, and military and government entities can benefit from increased security with the CAC reader. Powerful and efficient hardware: Bobcat features an Intel Quad Core Processor, 1.91 GHz CPU speed, four GB of DDR3L 1333 RAM, 128GB SSD and eight hours of battery life with an option to extend to a 14 hour dual-battery pack, boosting productivity for prolonged deployments. IP65 rating and MIL-STD-810G certification: The new tablet has an IP65 ingress rating to ensure operations in extreme environmental conditions, including rain and dust, and a MIL-STD-810G certification which verifies the tablet’s ability to withstand the common abuse faced during field service, such as multiple five-foot drops and operating conditions of minus 4 to 140 Fahrenheit. Fully-fledged Windows OS: Enterprises have the option to deploy Bobcat with either a Windows 8.1 Pro or Windows 7 Pro operating system (OS). The ability to utilize either OS allows enterprises to easily integrate Bobcat with existing software and equipment and run the vast majority of enterprise applications in the field. Touch optimized outdoor display: A direct bonded IPS screen, 500 nits of luminance and an 800-to-1 contrast ratio makes the Bobcat display ideal for outdoor readability, and a 10-finger multi-touch screen provides customers with ease-of-use and touch optimization. At 2.4 pounds, the Bobcat delivers a suite of standard features that extend the breadth and applicability of the tablet across a variety of industries from warehousing to military. The Bobcat comes standard with a three-year limited warranty and is currently available worldwide. For assistance finding the right rugged tablet for your needs, contact us at BarcodesInc.